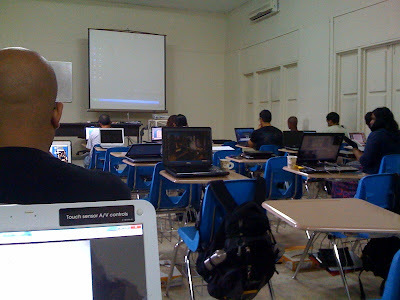 You may wonder what does a Caribbean medical school look like. Here is a pic of one of the classrooms. I took it from my camera phone on lunch break. Now the picture on the left is self-explanatory; the school has all the required equipment to teach the basic foundation of medicine. i understand that one could get accepted to the school if they have 90 credits. if i send in my application and was accepted, but decided to finish another yr and get my bachelors would i still have to reapply and hope i get accepted again? Well summer semester is always the smallest and I think they will always have seats at that time but I'm not sure. I know for a fact that you definitely have to call the Chicago office to get that answered correctly. The answer is an absolute administration decision. They are flexible if they have seats. I don't think they will let any more extra students out of the seat capacity until the current MD3 class graduates basic sciences. The current MD3 class is around 70 students because we don't have enough space. What's the average number of students in MD1? Usually 40 in Spring, 24 in Summer, and 50+ in Fall, I'm part of the largest class with ~70 students because we came in Fall 09 plus we have a small handful of students who failed from the previous semester.